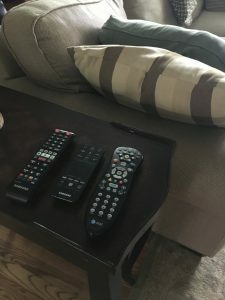 We have three remote controls for our living room television: one for the TV, one for the DVD player, and one to navigate all of the extras (Netflix, Amazon Video, YouTube, etc.) It is a necessity of the fallen nature of our world that at least one of those remotes should go missing every day. So when my youngest son was ready to watch his afternoon “chill-out” movie, the required remote could not be found. We took out all the cushions and checked the drawers of the hutch and the TV stand and the end tables. We checked in nearby rooms—the bathroom and the kitchen—but still no luck. When we looked under the sofa and the loveseat we found naught by giant dust bunnies, an orange bouncy ball, and a broken pencil. My son continued to search for the remote (his desire to seeMulan 2was this strong! ), but I shifted my focus to the dust bunnies. I brought out the dust mop and the vacuum. I ridded the hardwood floors of their gray layer of filth and vacuumed the living room rug which is known to be a prolific shedder. After I had the floors in “company’s coming” appearance, I stood up and glanced at the mirror hanging above the loveseat. I found the greasy imprint of a face—forehead, nose, and puckered lips—a gift from one of my dear darlings, no doubt. I put away the mop and vacuum and turned my attention to the Windex and paper towels. One thing led to another and before long I had cleaned most all of the glass surfaces in the living room, kitchen, and sunroom. This was not my plan. I had planned to get a movie started for my youngest and work on supper, but something clicked inside my head. A voice said, “Enough of this madness! You must cleanse this place!” The dust and the grime I walk past all too often finally mounted up past my level of tolerance to the extent that I was compelled to act. It’s weird, because the mess had been there for days but I was finally moved to act when I was searching for something else. It makes me wonder what other messes I am unaffected by, possibly because the job to clean them up or the frequency of the chaos is too great. I wonder if there’s an injustice I’ve ignored or a misery I don’t want to think about, but I’m actually supposed to get to work in that place. Maybe as I’m searching for some distraction, my eyes will be opened to a place that needs my care and attention. I recently saw the documentary Won’t You Be My Neighbor?about the life and work of television icon Fred Rogers. I had heard it was great and was warned to bring tissues. Both turned out to be true. Like many of my generation, I grew up watching Mister Rogers’ Neighborhood. I had a toy trolley that played “It’s a Beautiful Day in the Neighborhood” when you pushed it along the carpet. My sisters and I would talk like Henrietta Pussycat to each other: “Meow-meow, can I have some meow-meowKool-Aid, meow-meow?” And we would discuss the inherent creepiness of Lady Elaine. I still vividly remember watching the clip showing how crayons (or as Mister Rogers said in his Philly accent: cray-uns) are made. As a child, I didn’t appreciate how Mister Rogers encouraged me to feel my feelings. And I wasn’t aware of what he did to fight for public television and change the way people understand children’s entertainment. I watched his show until I outgrew it. His final episode aired just before I had my daughters, so it wasn’t a part of their childhood as it was mine. After watching the documentary, I was a little sad that my kids were left out of knowing this gentle, intentional TV figure. The documentary explained how very popular Fred Rogers was—people would line up for a chance to come to a live event—and I wondered if current kids would embrace his show in the same way. I wondered if kids are now too sophisticated to sit and watch a normal-looking guy tie his shoes and zip up his cardigan. Would it be too slow paced for kids who are so used to being constantly entertained? Sitting in the dark movie theater watching the credits roll and thinking that this generation is too cool for Henrietta Pussycat, I felt inexplicably sad. I felt like something was missing from childhood—Wonder? Imagination? Stillness? Gentleness? Then a series of pictures popped into my mind (like bubbles from the episode when Mister Rogers and friends make an opera called Windstorm in BubbleLand). I thought of kids at my youngest son’s cafeteria table smiling at me with orange peels covering their teeth. I thought of children shouting “Cannonball!” as they jumped and splashed into our swimming pool. I thought about the fact that there are still kids who catch lightning bugs and make mudpies and play with action figures. I think if he were still with us, Fred Rogers would take great delight seeing kids be kids in 2018. He’s quoted as saying, “Play is often talked about as if it were a relief from serious learning. But for children play is serious learning. Play is really the work of childhood.” Even if they can’t watch his show in the way we did, they can still implement his philosophies of kindness, self-worth, and playtime. http://abbyrosser.com/wp-content/uploads/2017/03/toplogo.png 0 0 Abby http://abbyrosser.com/wp-content/uploads/2017/03/toplogo.png Abby2018-07-09 22:25:352018-07-13 23:47:49Won't you be my neighbor? I once read the phrase “hand-watered garden” in the book East of Eden, and now I think of it each time I water my plants. The author’s intention was to imply that the man who owned the land was a small scale farmer/rancher. He had no complicated system in place to irrigate acres of fertile soil and crops. He just had a dusty plot of land, and he grew enough to feed his family without relying on abundance. I have a few plants I water most every day of the summer. If I skip a day—just one day—the heads of my baby blue hydrangeas I planted in late Spring in the front corner flower bed will be drooping on the mulch and my tomato plants in the tall container on the patio will look dry and shriveled and the flowers in the planters on my porch—the spiky, purple Veronica, the lime green Coleus, the fire red Impatiens—will begin to wilt. I have two watering cans for this task. When we’ve had rain, I fill them up from the rain barrel situated under a downpipe, but lately I’ve been filling up my watering cans with the outdoor faucet. Once full, I carry them in each hand, sloshing and spilling my way over to the plants. Then I refill. The whole thing takes up a good part of my morning, but I don’t really mind it. Today, as I filled and hauled and poured, I remembered that phrase “hand-watered garden” and I savored this chore as if it were a consecration—a carefully performed duty made sacred by its difficulty and importance. Then I was struck by how similarly I felt about my job as a parent. When my kids were babies, I was sleep-deprived because theywouldn’t sleep. They would get their days and nights mixed up or their sore, teething gums would make them irritable and uncomfortable. Now that they are getting older, there are times whenI can’t sleep. I lie awake thinking of their hopes and their future. I worry over seen and unseen forces lurking around, waiting to pounce on their innocence. Like those 55 steps from the house to that corner flower bed, parenting is not a job that can be done from a distance. It’s not always efficient and it’s often very, very hard. Carrying all that we know about the world and how it might hurt our kids is back-breaking, but nurturing a child and walking with her through both the miserable and the glorious is thrilling.